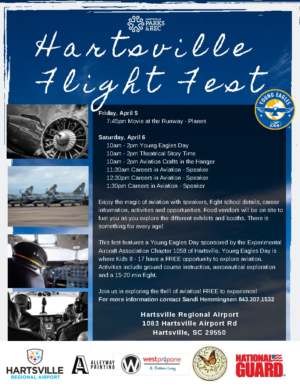 Kids ages 8-17 years old will have the opportunity to take a free flight around Hartsville with signed permission from a parent or guardian. This opportunity is provided by the Experimental Aircraft Association Chapter 1058. They will also be offering a promotional code to be a student member of the EAA, which opens up a free opportunity for online ground school course for the private pilot written exam. This entire event is made possible by the Hartsville Regional Airport, Alleyway Printing, Burry Bookstore, and West Propane.